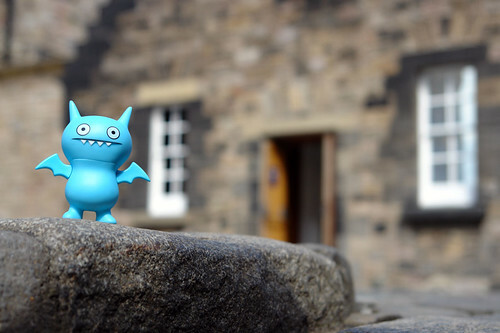 Uglyworld #506 - Ice-Bat Loves Edinburgh Castle, originally uploaded by www.bazpics.com. Ice-Bat was so over the moon when we finally caught up with him near the West wall of the castle, as he had found an out-building which he said looked like a huge face. Sure enough the windows did look like eyes and the door a nose, and when we asked Icy where the houses mouth was he jokingly replied, "Under the ground, eating cookies!"